Phuket beaches are an experience of their own. We spent three days vegetating, lounging and walking around to different beaches. Kata Noi beach is small, since it is edged by resort hotels and has minimal beach access to the public. 100 Baht rents you a beach bed and an umbrella under the trees. We spent the day lounging near the cafe at the edge of the rocks. Jules went for a run on the beach and I ventured in and out of the warm water, chilling and drinking coconut water. The cafe was very accommodating, and they made us a vegetarian green papaya salad and a tasty veg soup. Kata and Karon beaches stretch for a few kilometers along the coast. The road across the street is filled with shops and restaurants. Just like in Patong beach, they offer beachwear, money exchange, massage, juice bars, seafood and Thai restaurants, pizza, ice cream, tacky art, mini markets, tour operators, scooters for hire, jet skis, boat rides, etc. 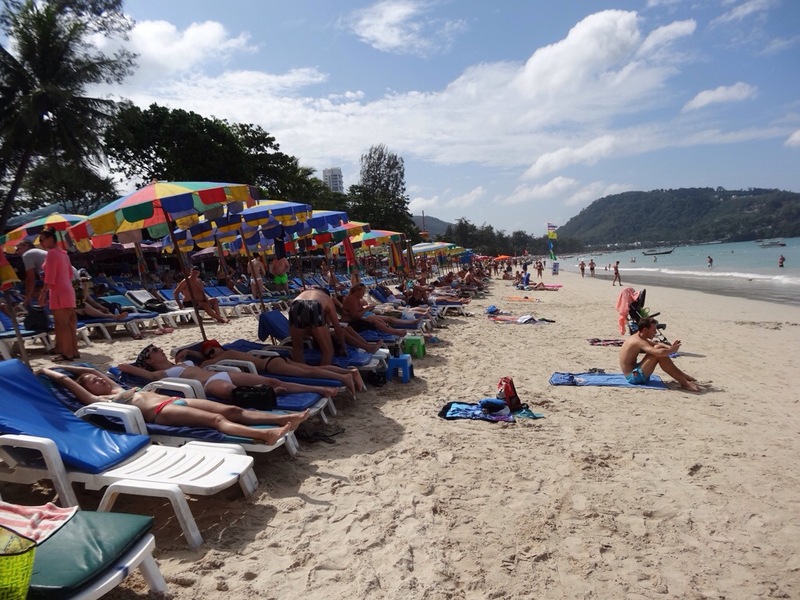 In Patong beach, dozens of beach bed rentals line the shore. Each business has its own color of beach umbrellas. When I went swimming, I had to try to remember which color was our area coded with…… Were we the blue and yellow umbrellas? Or maybe the blue and green? Or the green and red?…. It also took me awhile to figure out that each area had big flags posted in front of it. I had simply chosen the area because it had plenty of shade. We sat in an area featuring a big German flag, the yellow, red and black colors fluttering in the wind. Everyone around us spoke German, and we saw the exact same people every day. Some people do not like Patong beach because all day long, beach vendors walk by, offering fried Prawns, fresh fruit, ice cream, sunglasses, sarongs, and clothing. I liked having the fruit vendors pass by us, and I bought our lunches from them. The Germans bought a constant supply of beer and double extra large shirts from the happy vendors. The sand was fluffy and the water was clean and warm. After a relaxed week in Phuket, we boarded a rusty ferry from Rassada pier, to Phi Phi island. Back home in New Zealand, we are in the midst of renovating our bathroom, installing a new steam/dry sauna, and cutting down Privet and Flame trees that are overhanging my studio decks. We, of course do not do any of it ourselves; we speak to the contractor by Skype and arrange bank transfers…. It all seems very surreal to be doing this long distance, while we are covered in coconut oil or getting out of massage places where they have pulled our limbs apart to the breaking point…. Oh… How I love those massages, so we do try to get one daily. They cost only 250-400 Baht per person ($8-$14), and most of them are so much better than any massage that I have ever gotten in luxury Spas in the USA and around the world. Next, we leave Phuket and continue on to Phi Phi island.